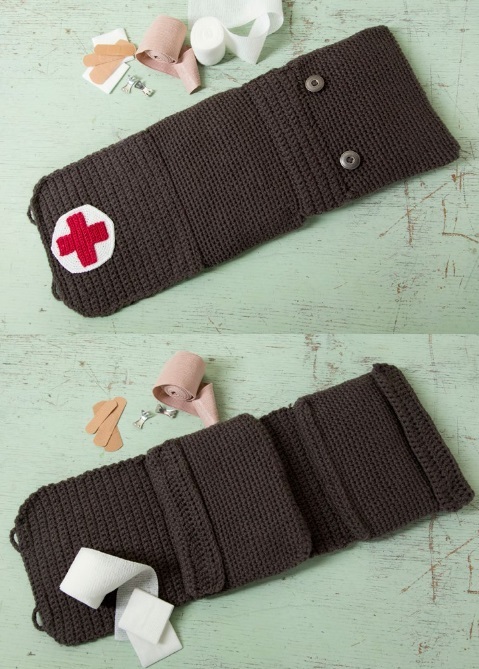 This vintage-style first aid kit is designed with two expanding pockets. It’s the perfect gift for those you care about. 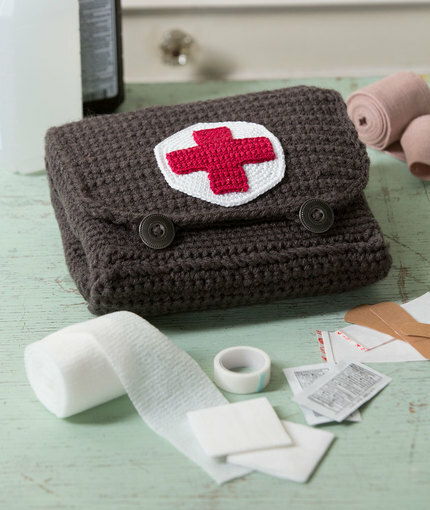 If you are not sure what supplies you should have in your crocheted kit, check the first aid kits at: redcrossstore.org. Visit www.redheart.com/redcross to learn more. Gauge/Tension: GAUGE: 15 sc = 4” [10 cm]; 15 rows = 4” [10 cm] in single crochet using size 3.75mm [US F-5] crochet hook and A. CHECK YOUR GAUGE. Use any size hook to obtain the gauge. help of two gusseted pockets for better organization. Snaps on the inner flaps keep the items secure in the pockets. 2. 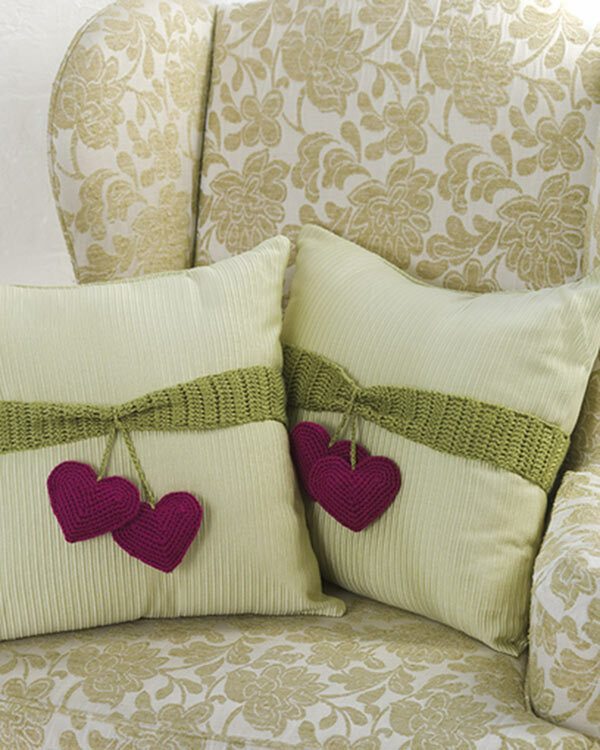 Pieces are worked separately and are sewn together. Leave long ends at beginning and end of pieces for sewing. Two Pockets are joined by a gusset piece along bottom edges. Pockets are gusseted and worked in the round for smoother look. 3. Some steps are worked back and forth in rows and others are worked in the round. and is sewn together using hand-sewing thread. Beginning at bottom pocket gusset with A and size 3.75mm [US F-5] crochet hook, ch 31. Row 1: Working in back bumps only, sc in 2nd ch from hook and each ch across – 30 sts. Rows 2-5: Ch 1, turn, sc in each st across. Round 6: Begin working in rounds, ch 1, turn, working in back loops only, sc in each st across, turn to work along side edge, sc 5 sts evenly spaced along side edge, turn to work along opposite edge of foundation ch, sc in next 30 ch, turn to work along opposite side edge, sc 5 sts evenly spaced along side edge – 70 sc. Place marker for beginning of round. Place marker in first st for placement of Bottom Gusset. Rounds 7-31: Working in continuous rounds, sc in each st around. Row 32: Ch 1, working in back loops only, sc in next 30 sts, leave remaining sts unworked – 30 sts. Rows 33-37: Ch 2 (counts as first hdc here and throughout), turn, hdc in each st across. Row 38: Ch 1, turn, sc in each st across. Fasten off. a slip st, ch 1, working in unused loops, sc in same st and in next 29 sts – 30 sc. Rows 2-9: Ch 1, turn, sc in each st across. Fasten off. 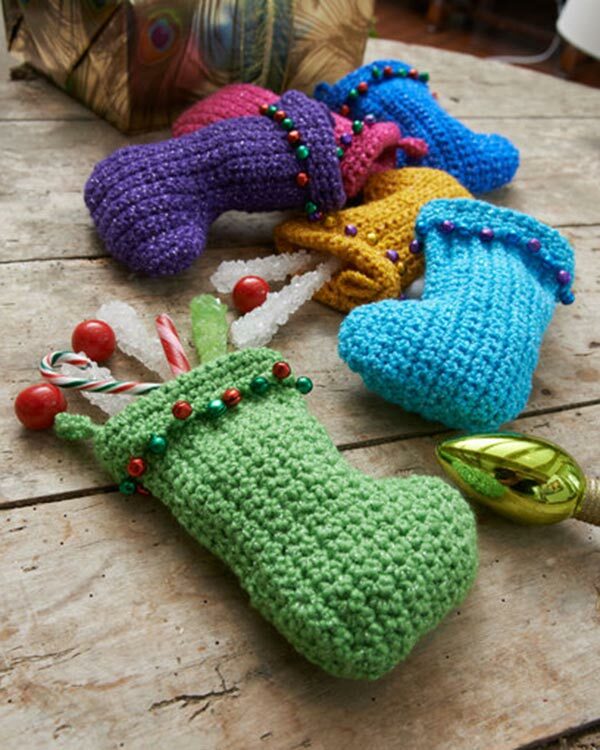 With size 3.5mm [US E-4] crochet hook and A, ch 32. Row 1: Working in back bumps only, sc in 2nd ch from hook and each ch across – 31 sts. Rows 2-28: Ch 1, turn, sc in each st across. Row 29: Ch 1, turn, skip first st, sc in next 28 sts, sc2tog – 29 sts. Row 30: Ch 1, turn, skip first st, sc in next 26 sts, sc2tog – 27 sts. Row 31: Ch 1, turn, skip first st, sc in next 24 sts, sc2tog – 25 sts. Row 32: Ch 1, turn, skip first st, sc in next 22 sts, sc2tog – 23 sts. Fasten off. Row 33: With right side facing, size 3.5mm [US E-4] crochet hook, join A with a slip st in first row of Outer Flap, slip st evenly spaced around sides and last row of Outer Flap, leave opposite edge of foundation ch unworked. Fasten off. Sew Outer Flap to unworked loops of Row 32 on Pocket 1. Fasten off. With size 2.25mm [US B-1] crochet hook and C, ch 19. Row 1: Working in back bumps only, sc in 2nd ch from hook and each ch across – 18 sts. Rows 2-6: Ch 1, turn, sc each st across. Fasten off. Row 7: With right side facing and working along last row, skip first 6 sts, join C in next st with a slip st, ch 1, sc in same st, sc in next 5 sts, leave remaining sts unworked – 6 sts. Rows 8-12: Ch 1, turn, sc in each st across. Fasten off. Working along opposite edge of foundation ch, repeat Rows 7-12 of First Cross. With size 2.25mm [US B-1] crochet hook and B, make an adjustable loop. Round 1: Work 6 sc in adjustable loop – 6 sts. Round 2: Work 2 sc in each st around, slip st in first sc to join – 12 sc. Round 3: Ch 1, [sc in next sc, 2 sc in next sc] 6 times, slip st in first sc to join – 18 sts. Round 4: Ch 1, [sc in next 2 sc, 2 sc in next sc] 6 times, sc in space before join, slip st in first sc – 25 sc. Round 5: Ch 1, [sc in next sc, 2 sc in next sc, sc in next 2 sc] 6 times, sc in last st, slip st in first sc – 31 sc. Round 6: Ch 1, [sc in next 2 sc, 2 sc in next sc, sc in next 2 sc] 6 times, sc in last sc, slip st in first sc – 37 sc. Round 7: Ch 1, [sc in next 3 sc, 2 sc in next sc, sc in next 2 sc] 6 times, sc in last sc, slip st in first sc – 43 sc. Round 8: Ch 1, [sc in next 2 sc, 2 sc in next sc, sc in next 4 sc] 6 times, 2 sc in last sc, slip st in first sc – 50 sc. Round 9: Ch 1, [sc in next 4 sc, 2 sc in next sc, sc in next 3 sc] 6 times, sc in last 2 sc, slip st in first sc – 56 sc. Round 10: Ch 1, [sc in next 2 sc, 2 sc in next sc, sc in next 6 sc] 6 times, sc in last 2 sc, slip st in first sc – 62 sc. Round 11: Ch 1, [sc in next 5 sc, 2 sc in next sc, sc in next 4 sc] 6 times, sc in last 2 sc, slip st in first sc – 68 sc. Round 12: Ch 1, [sc in next 5 sc, 2 sc in next sc, sc in next 5 sc] 6 times, sc in last 2 sc, slip st in first sc – 74 sc. Round 13: Ch 1, [sc in next 6 sc, 2 sc in next sc, sc in next 5 sc] 6 times, sc in last 2 sc, slip st in first sc – 80 sc. Sew female side of 2 snaps on right side of each Pocket, about 1” [25 mm] down from last edge before Pocket Flap shaping and 5” [12.5 cm] apart. Sew corresponding male part on wrong side along top edge of Pocket Flaps. Fold Pocket fronts together, lining up edges. Fold Outer Flap over top edge of Pockets to outside edge of Pocket 2. Sew two buttons, 5” [12.5 cm] apart, just below bind-off edge of Outer Flap. 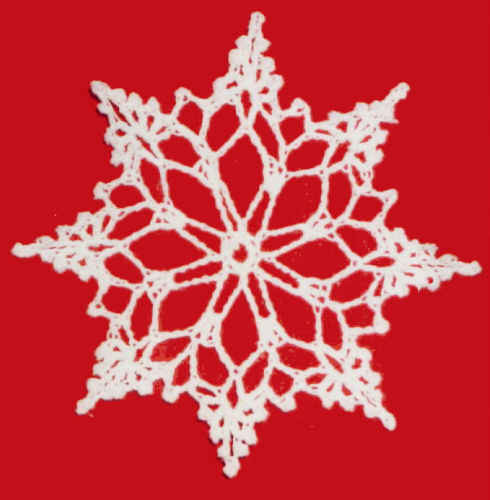 With right side facing and using size 3.75mm [US F-5] crochet hook, join A along edge of Outer Flap with a slip st, lining up with button, ch 5, slip st in next st on Outer Flap. Fasten off. Repeat to make second buttonloop above second button. Sew Red Cross in center on right side of White Circle. Sew Circle on right side of Outer Flap. Weave in ends.